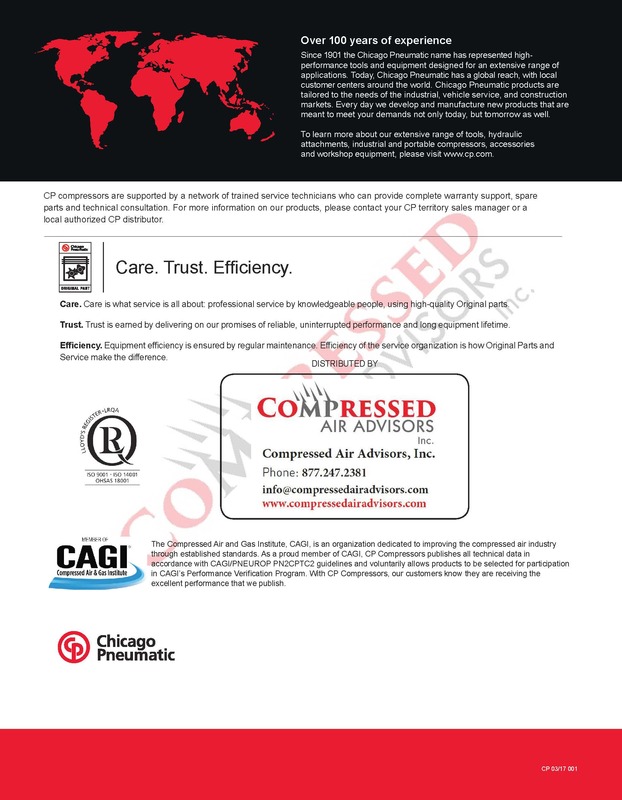 The Chicago Pneumatic Variable Speed (CPVS) compressor allows you to save operating costs when your application does not require the compressor’s full capacity. 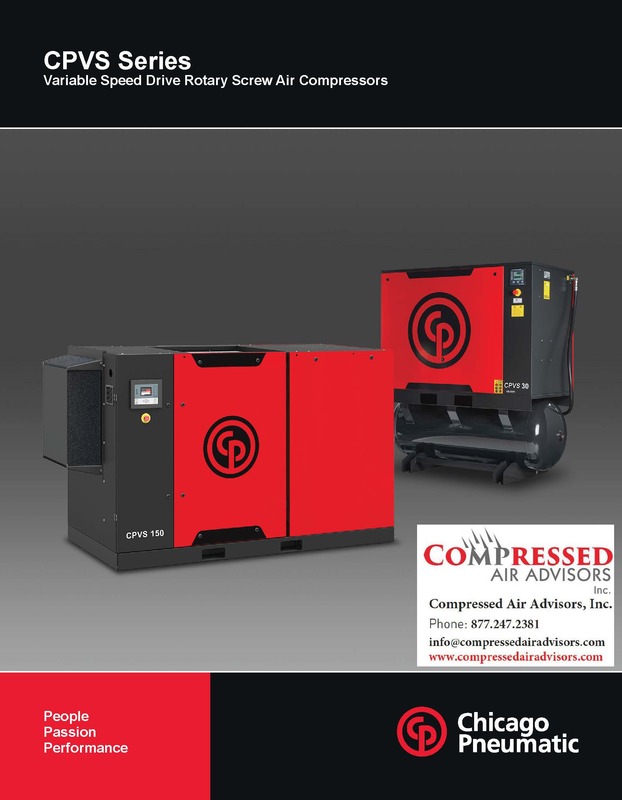 Artificial intelligence automatically maintains designated pressure and provides only the air that your system requires. As a result, you save energy and money. 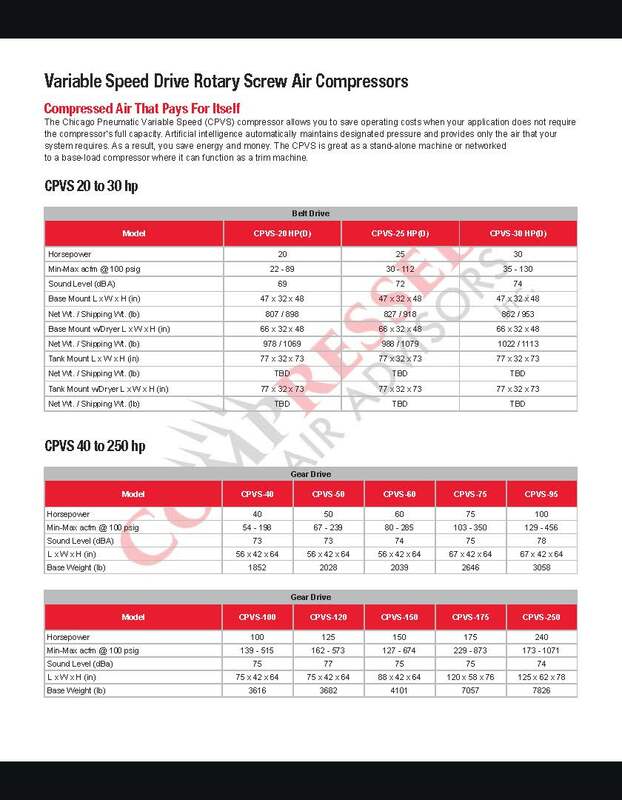 The CPVS is great as a stand-alone machine or networked to a base-load compressor where it can function as a trim machine. 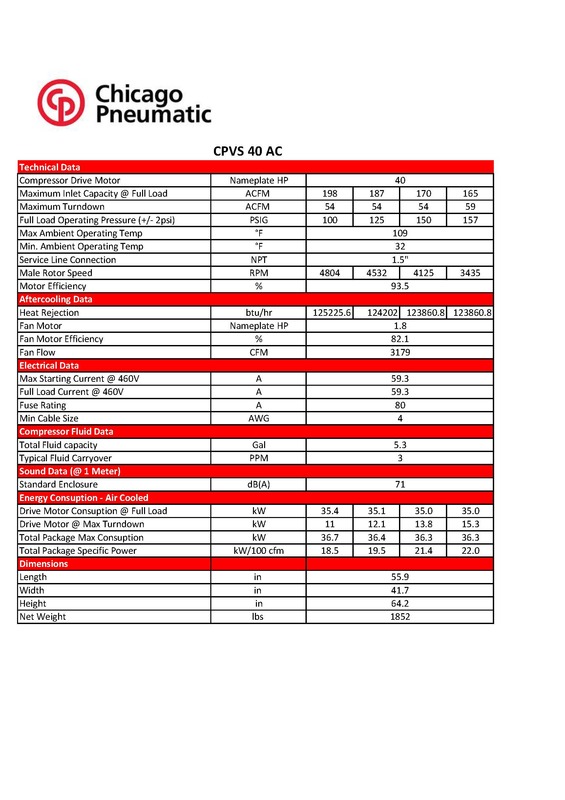 Every CPVS comes with a rugged, Vacon variable speed drive that does much more than simply control the speed of the motor. The VSD comes completely programmed and wired, so time spent on installation and set-up are minimized. The VSD also includes a removable LCD display, integrated cooling fans, built-in line reactor and electromagnetic frequency filters as standard equipment. 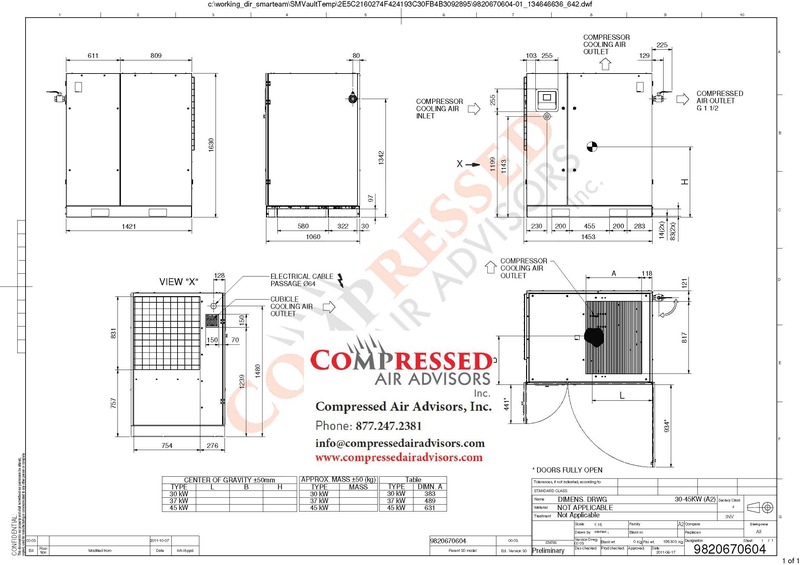 Competitive VSD compressors require external vents to keep the VSD cool during operation. Ventilated VSDs still overheat and ultimately fail in the field because they become contaminated as dust and debris are ingested over time. The VSD on the CPVS has integrated fans which use cool air from the intake and do not require vents in the electrical cabinet door. The VSD always stays cool and protected. The line reactor protects against voltage spikes and fluctuations, also known as “dirty voltage”. 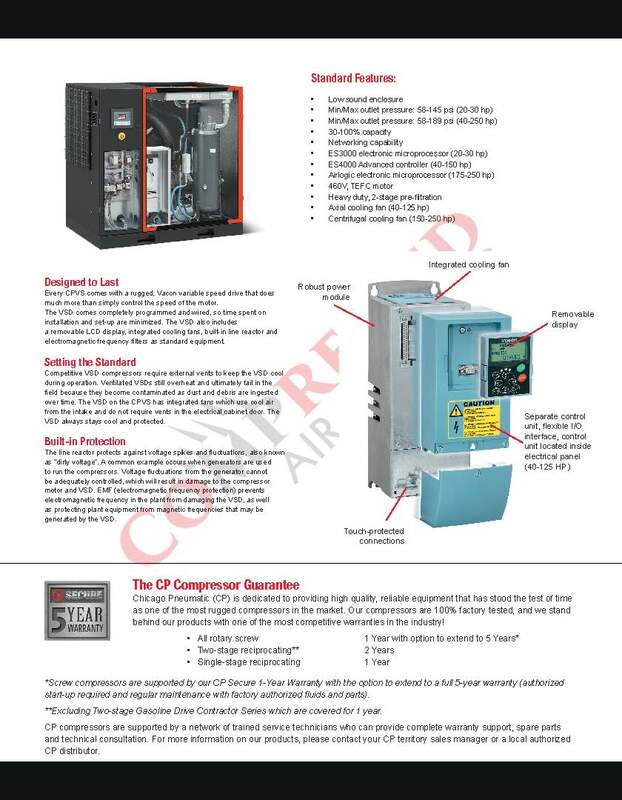 A common example occurs when generators are used to run the compressors. Voltage fluctuations from the generator cannot be adequately controlled, which will result in damage to the compressor motor and VSD. EMF (electromagnetic frequency protection) prevents electromagnetic frequency in the plant from damaging the VSD, as well as protecting plant equipment from magnetic frequencies that may be generated by the VSD.